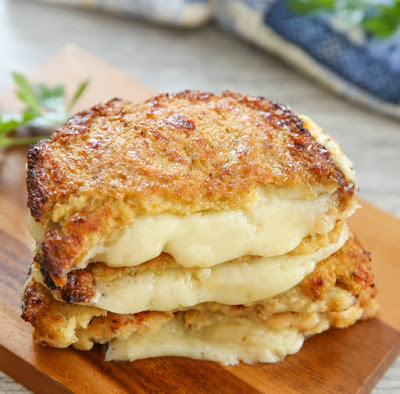 This is a great low carb solution that still allows you to enjoy a comforting grilled cheese sandwich. The bread is made out of cauliflower! Yes, we’re still eating a ton of cauliflower at home. We also eat a lot of grilled cheese sandwiches, so this combines the best of both worlds. 1. Preheat oven to 450F. Place cauliflower into food processor and pulse until crumbs about half the size of a grain of rice. 3. Stir cauliflower to mix up the bottom and top cauliflower. Place back into the microwave and cook for another 3 minutes. Remove and stir again so that all the cauliflower cooks evenly. Place back into microwave and cook for 5 minutes. At this point, you should see the cauliflower is starting to become more dry. Microwave for another 5 minutes. Cauliflower should still be slightly moist to the touch, but should look dry and clumped up (like photo above; similar to as if someone had chewed it up and spit it back out.) If you've made cauliflower pizza or breadsticks with the cloth wringing dry method, it should look the same. 4. Allow cauliflower to cool for a few minutes. Then add in egg and cheese. Stir to combine until smooth paste forms. Stir in seasoning. Divide dough into 4 equal parts. Place onto large baking sheet lined with parchment paper. Using your knuckles and fingers, shape into square bread slices about 1/3 inch thick. Bake cauliflower bread for about 15-18 minutes or until golden brown. Remove from oven and let cool a few minutes. 5. Using a good spatula, carefully slide cauliflower bread off of parchment paper. Now you are ready to assemble your sandwiches. You can do this a few different ways. You can either cook on the stove top as you would normally cook a grilled cheese. You can also place sandwiches into toaster oven and broil for several minutes (5-10) until cheese is completely melted and bread is toasty. If you don't own a toaster oven, you can also do this in the oven.